We know that teacher quality is the most important factor that drives scholar achievement. Purpose Prep teachers know that the work they do is changing the life trajectory of their students. They make it happen in their classrooms every day - from the way they greet each scholar with a respectful handshake and eye contact to the way they approach lesson planning with academic rigor and genuine joy in mind. At Purpose Prep, we use effective practices to recruit, attract, develop and retain educators of the highest caliber. We seek teachers who believe strongly in our mission and whose actions demonstrate high expectations for themselves, scholars and families. We hire smart, driven people willing to work hard to realize our mission and have the characteristics and experiences necessary to deliver ambitious results for scholars. Why teach at Purpose Prep? 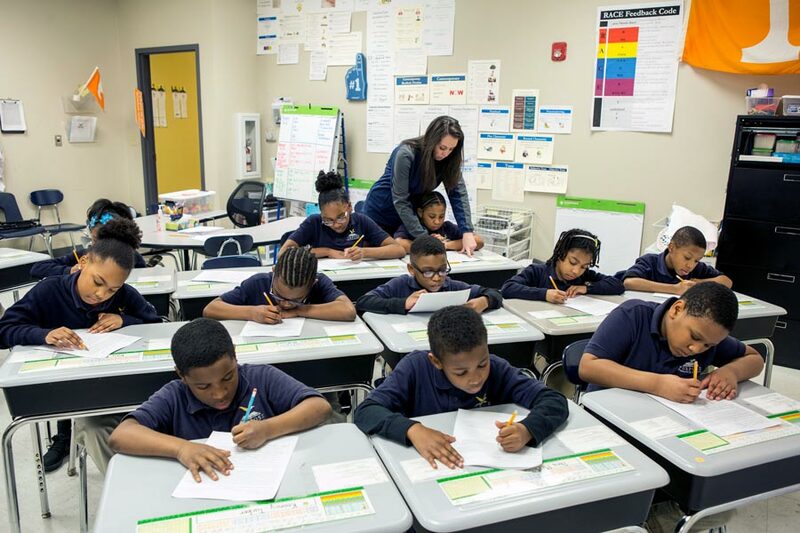 Every member of Purpose Prep believes that every child, regardless of race, socioeconomic status, or incoming academic level, is capable of achieving high behavioral and academic success. Purpose Prep has committed to achieving a mission that ensures all children develop the academic skills, knowledge, and ethical foundation to be set on the path to college. Achieving our mission and becoming one of the highest performing elementary schools in our nation requires unwavering commitment and hard work. Indeed, changing the world has never been an easy task, but the lives of each and every scholar are well worth it. Effective teachers are made, not born. We prioritize the instructional development of our educators, so they can achieve their strongest potential in their classroom – and so that their scholars can achieve their fullest potential. With a four-week professional development institute prior to the start of the year, excellent school visits to observe and analyze the highest performing practices across our nation, and ongoing observation - feedback loops, we prioritize ongoing, varied opportunities for teachers to improve their instruction. We know that teamwork is the ultimate advantage that distinguishes high performing organizations. Team beats individual. Purpose Prep achieves its goals through the collective effort of dedicated individuals working diligently towards our shared mission. Our staff is a cohesive, respectful team that embodies our core values in order to RISE with Purpose. We trust each other, engage in passionate, unfiltered dialogue, are committed to our goals, and hold each other accountable to results. At Purpose Prep, we are always searching for exceptional educators, leaders, and staff who share our belief that every child can excel and possess the commitment to translate that belief into reality. ...Then you are that exceptional person who belongs on the Purpose Prep Team! Purpose Prep holds all staff to high expectations and provides the necessary supports to ensure they achieve ambitious goals for scholars. Professional development and continuous improvement is integral to the Purpose Prep way. Quality teacher development is the key to attracting and retaining talented individuals and the lever to raising student achievement levels. The children of Nashville deserve the highest quality educators, and we deem it our responsibility to support our teachers to execute dramatic student results. We know that when classroom instruction improves, student achievement gains increase. Therefore, we prioritize ongoing, varied opportunities for teachers to improve their instruction through classroom observations and feedback, data analysis and action planning meetings, curriculum development and review, professional learning communities, video analysis and debriefs, excellent classroom and school visits, and mentorship and leadership opportunities. Our teachers are developed to be the best in their craft. Every staff member receives targeted support based on their needs and school goals to ensure a continuous cycle of conversation, reflection, and improved instructional ability. This individual development, along with grade-level and school-wide collaboration and teamwork, make our school the optimum learning environment, not only for our children, but also for our adults.